Certified Copies & Notarized Statments. Mobile Service Throughout San Diego. Traveling Notary Services in San Diego. Commissioned by the California Secretary of State. Member of the NNA – National Notary Association. In order be appointed as a notary public, you must successfully complete the stringent requirements set by the California Secretary of State (SOS). An individual who holds a California notary commission must have completed the required courses, passed the written exam and demonstrated “good character” qualities by undergoing a thorough background check by the Federal Bureau of Investigation as well as the California Department of Justice. The Secretary of State has certified Alive Scan to notarize documents any where in the state of California. We are experienced at acknowledgements, jurats, affidavits etc. We are also certified as a Loan Signing Agent. Alive Scan even offers traveling notary services throughout the entire San Diego area. Specific notary skills are vital to overseeing loan signings for lenders, title companies and signing services. Loan Signing Agents are the final link to completing the loan package. They ensure that real estate loan documents are executed by the borrower and returned for processing on time. Completing this critical part of the loan process enables the loan to be funded. Loan Signing Companies trust our experienced San Diego Loan Signing Agent. Certified Loan Signing Agent | Notary Signing Agent (NSA). California Real Estate Salesperson License. Associate in Science Degree in Real Estate. Experienced, Professional, Reliable & Flexible! 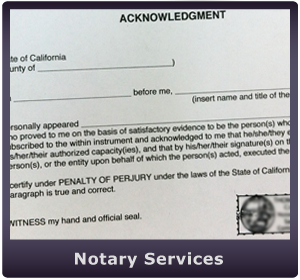 Our San Diego Notary offers a very convenient mobile service. This service is commonly used by individuals who have time sensitive loan documents that need to be notarized. The mobile service is also great for people with disabilities. What ever the reason, we are happy to provide this convenient service. Call today for more information!